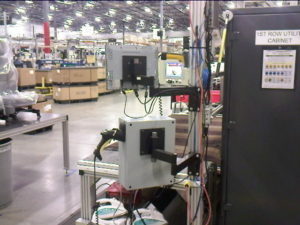 Dectron Kaizen Arms mounted to extruded aluminum profile supporting a computer and hand held scanner. Extruded Aluminum Profiles commonly known as T Slot or 80/20 is routinely used in industrial facilities all over the world. Modular by design, extruded aluminum is excellent at providing a robust, and extremely versatile solution for building customized fixtures and structures critical to furthering 5S and lean manufacturing objectives. Often times though, we’ve seen manufacturers struggle with accessorizing structures in an efficient manner. 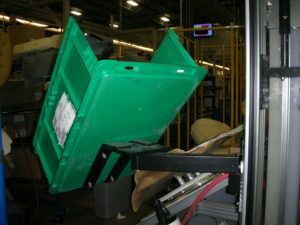 Hours can be spent trying to mock up or cobble together accessory arms to hold and position critical components, computer equipment, or tote bins. Even worse is when they’re avoided all together, which results in lost opportunity to really improve ergonomics, point of use access and space utilization. Dectron Kaizen Arms, however, are designed to easily integrate with extruded aluminum profiles and ergonomically position everything from custom applications to tool boards and computer systems. In addition to the ergonomic benefits, Kaizen Arms also provide a space saving feature by eliminating the need for additional fixtures to support periphery tools and applications. Instead of building an additional structure or cart, simply mount Kaizen Arms to your existing fixture to support applications that require additional space. With some simple ergonomic thinking and a basket of modular Kaizen Arm components, you can reduce your modular framing build time, save valuable floor space, and take your flexible assembly structures to the next level of lean.